This is designed for those who are unable to speak any Mandarin and are planning on working or studying at UNNC or in other parts of China. 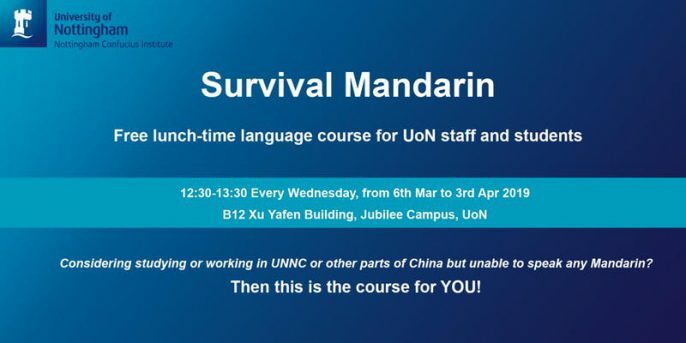 Survival Mandarin has been developed to provide a taste of the Chinese language and culture to assist with settling in to a new work or study environment. The course covers useful basic phrases and provides practical advice on living in China. The course runs every Wednesday 12.30-13.30pm from Wednesday 6 March for five weeks in B12, Xu Yafen Building, Jubilee Campus. For more information, and to register, please visit the event page.